I've heard good, but vague, things about Makoto Yukimura's Planetes from a few years ago and finally got a chance to read the first volume. One of the unwritten tenets of science fiction is that it's a vehicle to explore the human condition. The idea is that, no matter how much technology we have at our disposal, we're still the same, emotionally frail beings that we've always been. Creators can show us how we'll react in the same ways to the same types of things, regardless of the superficial trappings and environments we deal with. In a story like Star Wars, that theme is provided in relatively simple terms and more emphasis is placed on action and adventure. 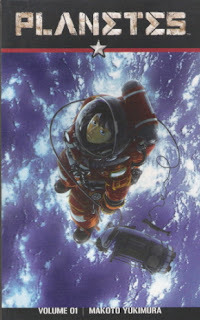 But with Planetes, the focus is on the varying ways we, as human beings, deal with Life. Each chapter of the book has its own, relatively self-contained story. And each story focuses on one or two very specific aspects of humanity. For example, in "Phase Three" a series of terrorist bombings have effectively eliminated pilot Kee's ability to take a simple cigarette break. In a rather drastic moment, her good judgment seems to fall to the wayside when she tries to thwart a planet-threatening terrorist attack with a kamikaze-style counter attack. Bravery and heroism, or artificially induced anger caused from nicotine deprivation? One of the immensely elegant aspects of the book is that it is always about the characters. Who they are, how they react, and why they do what they do. But it is still filled (one might say "littered" but that might be construed as a bad pun) with fairly hard science. All of the problems that today's real-world scientists talk about when discussing long-term space travel are on display and clearly well-thought out and researched. What happens when someone spends the first 12 years of their life in the decreased gravity of the moon? What the potential effects of radiation on the human body when it's not protected by the Earth's atmosphere? What are the psychological after-effects of being "lost" in space? These are things that are very real concerns for scientists, and Makoto uses them as props to hold up a mirror to ourselves incredibly effectively. "The clarity I'm searching for does not, indeed, exist. Outer space... Earth... They are names. One is no different than the other." We're all just hurtling through space, trying to get by from day to day. Most of us are stuck on this little blue-green planetoid. A few are floating in a hollow piece of metal in orbit around it. But it's really no different -- we're all still human. We're all made out of the same mix of chemicals. And what it means to be human, to live as a human... well, poets and philosophers have been working on that since the dawn of history. And while Makoto doesn't exactly solve that riddle for us, he does a damn fine job providing clues. I'm a big fan of the TV show but I've never read the comic.